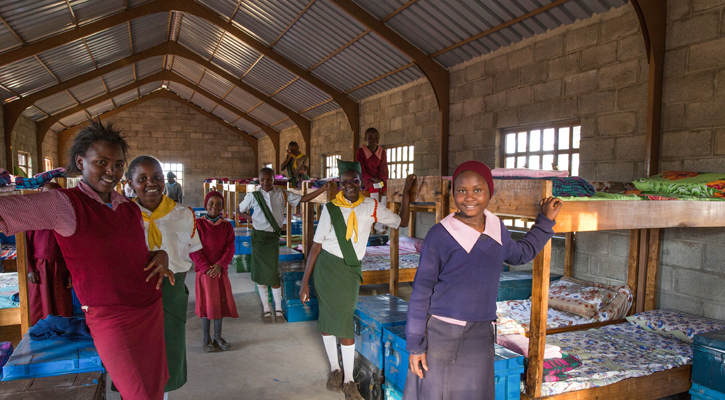 Less than a year after Maranatha volunteers completed the construction of a new girls’ dormitory at Kiirua Seventh-day Adventist School in Meru, Kenya, the principal is reporting an overall increase in students. In 2017, there has been a 30% increase in students, overall, with a 64% increase at the secondary level. In the dormitories, which houses both primary and secondary levels, there has been a 42% increase with the girls and a 53% increase in residential students overall. Last August, 58 volunteers arrived on campus to build the dormitory, which was completed in a week. The new building has a steel frame and roof, concrete floor, and block walls. It is a significant improvement from their old dorm, which was crumbling and provided little protection against the cold weather of the region. Volunteers also generously provided the students with new mattresses, pillows, blankets, towels, and storage trunks. The existing bunk beds were sanded and restained. The project in Kiirua was the second volunteer mission trip to Kenya coordinated by Maranatha. This year, there are six projects scheduled to take place in Kenya and more slated for 2018. If you’re interested in volunteering in Kenya this year, check out the upcoming opportunities. On September 18, 2017, the island of Dominica was devastated by Hurricane Maria.